When it comes to fishing boats, the more you can pack into a small package, the more value you are able to offer your customers. Perhaps no boat better exemplifies this better than Princecraft’s Sport 164. For 2017 this popular model is back, better than ever, and features a host of improvements that will allow it to pick up right where it left off. A little background - the Sport Series by Princecraft is for those who, I wouldn’t say are serious about fishing, but rather are serious about simply being out on the water and having fun. Naturally it is still a dedicated fishing boat geared towards Pros, but performance, sportiness and versatility are the name of the game for this series. The baby brother of this line up the 164 packs a lot of action into a manageable, and better yet, easily towable package. 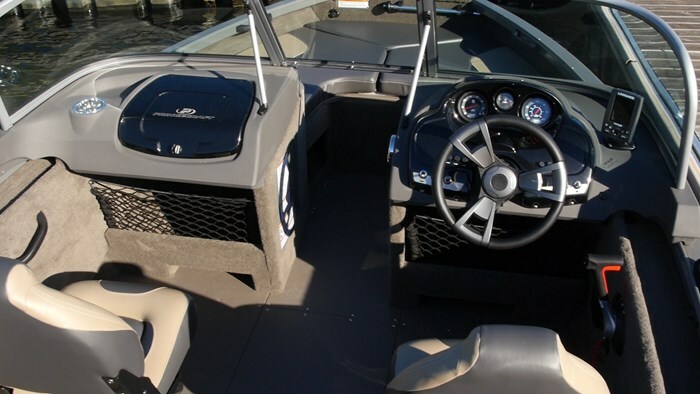 The Sport 164 features a 90-inch beam, which for the 16-foot boat segment is close to - if not the widest in the game. What this allows for is a couple of things: first it gives you the most amount of interior space and secondly it allows for the most amount of safe horsepower. Touching first on the interior space, when you first walk up to the Sport 164 you can tell it is ready for anything you can throw at it. The stern casting platform has been made bigger for 2017 thanks to the motor well being made smaller. This gives you more space where you need it and what Princecraft has done with it is given you a seat base, two drink holders, an optional ski pylon and 2 standard flip up jump seats. 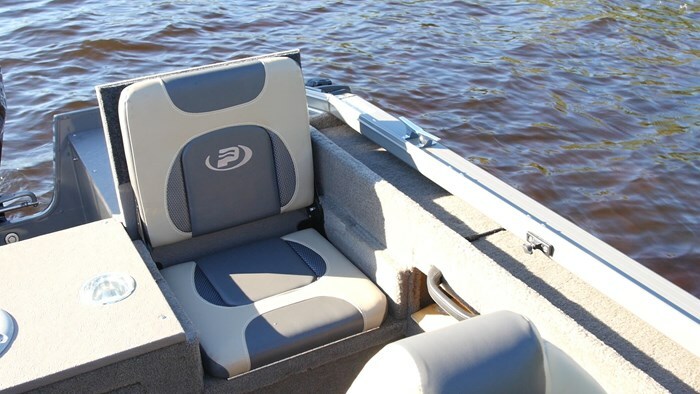 These jump seats are great for when the fishing is done and Princecraft builds them to last, giving them full support when they are in the folded down position along with no exposed hinges that you could catch your feet on. There is open gunnel storage, grab handles and toe-kicks, along with carpet finishing that will help reduce the noise when running. You will also find rod straps on the tops of the gunnels for when you’re quickly moving to a different fishing spot close by, you place your rods down, strap them in and you’re on your way. Twin fishing seats sit behind the dual consoles, complete with full windscreen that is raised above the consoles to give you complete coverage and keep the rim of the windscreen above your line of sight. When you’re sitting inside the Sport 164 you quickly forget about its 16 and a half foot length as every inch of the 90-inch beam is used to give you more space than the numbers lead you to believe. 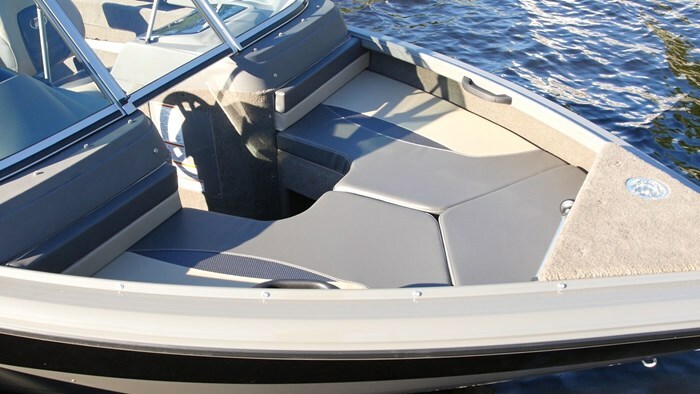 Not only that, but the reverse chine hull design provides exceptional stability when at rest. I’m about 200 pounds and the 164 barely had a lean as I moved from side to side during my walk through. Moving into the bow, this 164 was displayed with the optional snap in bow cushions which expand your bow deck’s use beyond the standard fishing arrangement. Complimenting these optional cushions you will find fixed padded backrests and matching grab handles, perfect for the Sport part of this model. 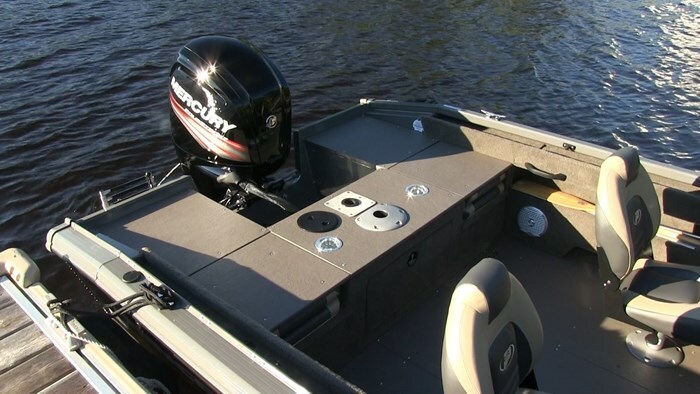 Fishing is still priority number one though, so up front you will find the 10-gallon live-well, another seat base, drink holder, as well as plenty of room to mount a trolling motor with the plug already there, waiting connection. Available in either black or red high gloss paint, the Sport 164 features the same exterior styling and striking lines of it’s higher end siblings, the Xperience and Platinum series. All of which blend the lines of fishing boat and sporty runabout, and don’t at all look like your traditional aluminum boat. If you were to walk up to this boat at a show, you might have to tap the hull sides, just to make sure. 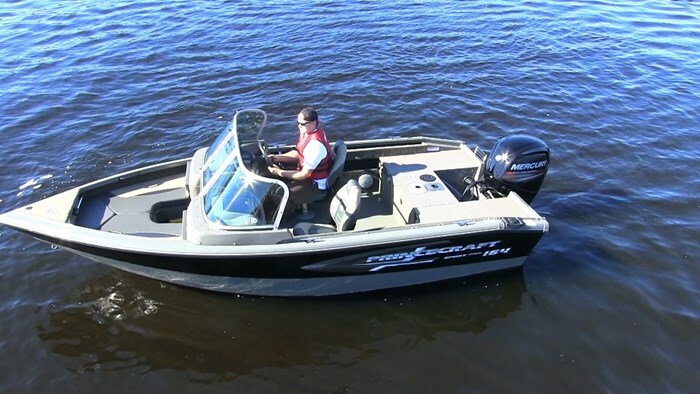 Designed to run safer with more horsepower, the Sport 164 has a max HP rating of 115. The model I tested was displayed with a 90-hp Mercury Four Stroke outboard. Having tested over a dozen Princecrafts in my day, I usually know what to expect with each boat, but I’m always excited to get behind the wheel and give each one a go. 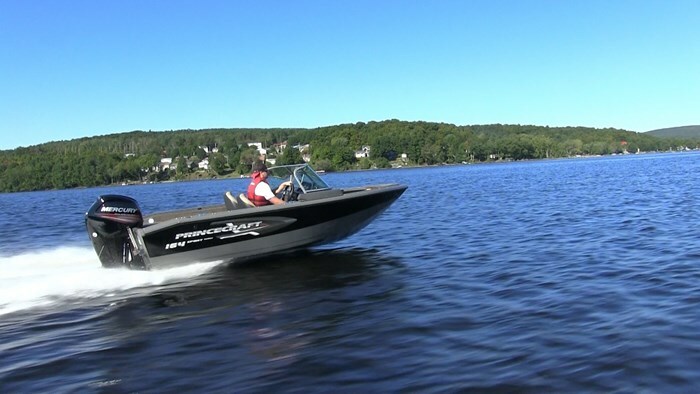 Princecraft has found the magic combination with their hull design that gives them great lift, fast planing time and exceptionally dry rides. The reverse chine hull and wide chine width helped get the 164 on plane in 2.8 seconds and to 20 mph in 4.6 seconds. Fast planing times are important for fishing when trying to get up on plane in skinny water, but also for watersports, so luckily that won’t be an issue for the 164. The mid-range cruise speeds of the Sport 164 found us at 20.4 mph at 3000 rpm, 26 mph at 3500 and 29.6 mph at 4000 rpm. An almost 10 mph jump between 3000 and 4000 rpm shows me that this motor and hull are working very well together. 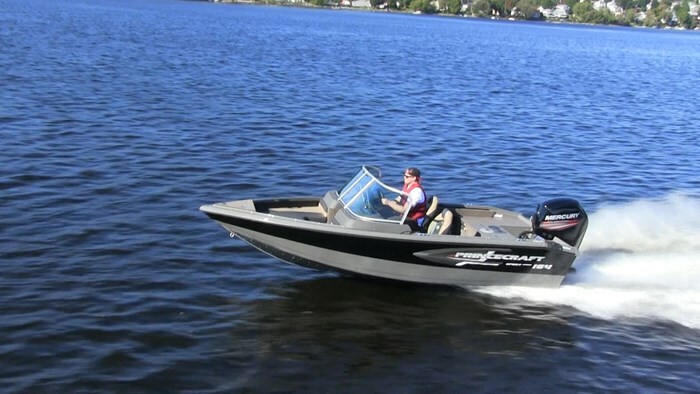 The 90 hp Mercury Outboard is a reliable motor that’s practically bullet proof thanks to it’s easy to maintain design. Testing on a rather calm fall day in Quebec, I had to stir up my own waves with the 164 to see how it managed rough water, and just like every Princecraft, it shot the waves down and away from the boat, keeping the interior dry. I even looked back to see if any water drops jumped up onto those rear jump seats, to find them untouched. It’s nice to know that even in a 16-foot boat you’re going to stay safe and dry.